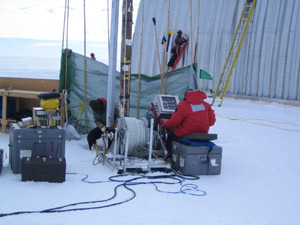 Although our PRISM team does not drill any ice cores, ice coring is another way scientists learn about the ice sheet and the climate thousands of years ago. Since there was a group drilling some ice cores while we were there, we asked if we could pay them a visit and learn more about the process. They let us spend a whole afternoon with them and it was so interesting. This is the drill site and you can see the drill operator in the red coat and another member of the team cleaning off the bottom of the drill. 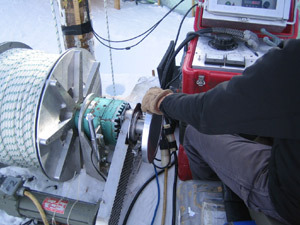 The big spool next to the operator holds the drill cable. 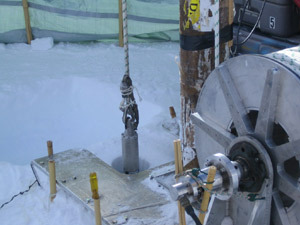 The drill is mounted to a cable that runs over the top of a pole with a big pulley at the top. There are sensors on the pulley that send the information to gauges. 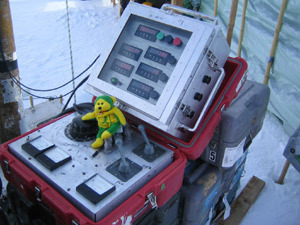 OzGold is watching the gauges to see how deep the drill is. That is the gauge at the top right. The one at the bottom right tells how much load is on the cable. 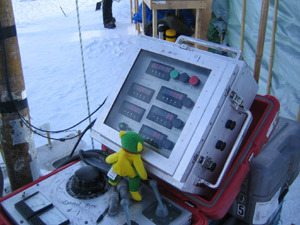 Each ice core is 1 meter long, so the drill operator lets the cable down until the drill is right on top of the ice, then drills for 1 meter (the gauge tells her when this happens) and then brings it up. Each time she brings up a core, it leaves a hole behind. 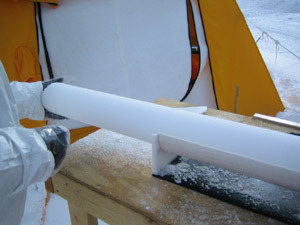 Then she puts the drill in the hole and lowers it until it is sitting on ice again. Then the whole process begins again. She does this again and again until they have drilled several hundred cores. OzGold watched her drill 5 cores today in about an hour. She said that sometimes it takes longer when they get deeper. Once they get the drill in place, the levers are turned to expose the drill bit and they set the speed of the drill bit with this control. 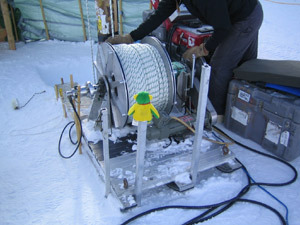 With help from Lou, OzGold is ready to start the actual drilling. Lou keeps her hand right on the drill so she can feel it drilling. This allows her to control the speed so the core is drilled very smoothly. If the wheel starts bucking or slowing down, she knows to she needs to drill more slowly. It should feel smooth all the way down. Here they have brought the drill up to the surface. You can see it just appearing from the hole in the middle of the picture. They take the outer drill cover off the core and lay the core in a cradle on the table. Then they use a padded stick to push the core out. They are very careful that they don't break the core. You can see the core being moved into the white cradle here. Then a person in a "clean suit" comes and takes the core into the "clean room." This is a tent. He weighs and measures the core, labels it, puts it into a plastic bag, puts the plastic bag into a tube, then puts the tubes into a carton. 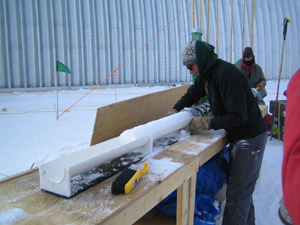 The ice cores will be flown back to the United States under refrigeration and will be kept for scientists to study. You can see more of the process in the PRISM gallery if you are interested.